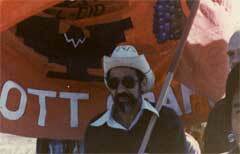 Tomas Villanueva led the UFW in Washington Stae on several boycotts and strikes throughout the 1980s. Photo: Tomas Villanueva Collection. In April 1986, Cesar Chavez led over 2,000 farm workers on a march from Granger to Yakima to protest low wages.Photo: Tomas Villanueva Collection. 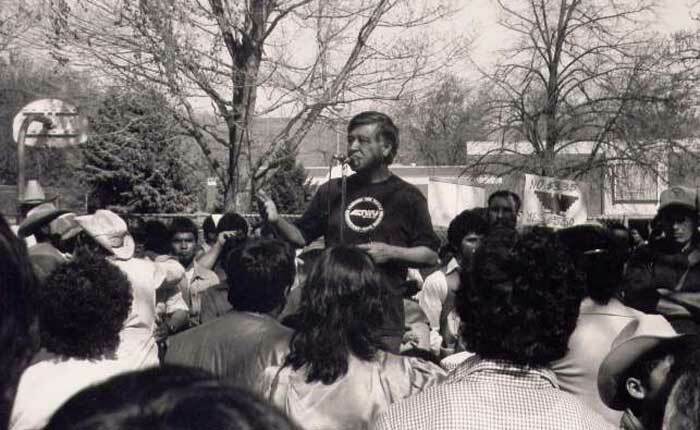 Cesar Chavez speaks to farm workers and supporters after the march from Granger to Yakima, April 1986. 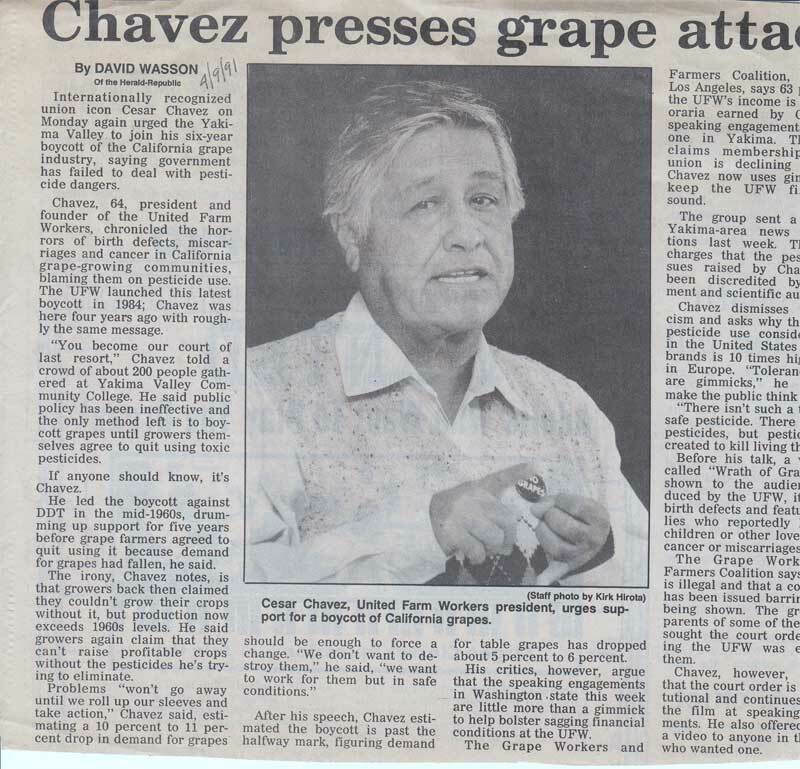 In 1991, two years before his death, Chavez was still rallying attention to the plight of farm workers, urging ta group of 200 people at Yakima Valley Community College to boycott grapes. Yakima Herald Republic, April 9, 1991. Striking workers from Chateau Saint Michelle sought out labor activist leader Rosalinda Guillen for support. Through her successful campaign leadership, farm workers eventually achieved a union. Rosalind Guillen is one of the narrators in our video oral history page. 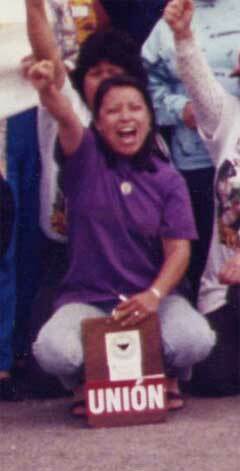 Active in the UFWOC, she would became the leader of the Cheatuea Saint Michelle strike campaign in Washington State. Chateau Saint Michelle workers hold up fists in victory after they finally achieved a union in 1995. Photo: Rosalinda Guillen Collection. Many local farm workers learned about unions and political activism through the KDNA social service center, _el Centro Campesino/_the farm worker center. At el Centro discussions often focused on organizing a farm worker’s union, which had been the goal since the 1970s wildcat strikes. Discussions also centered on forming an official Washington UFW branch, also a long frustrated goal. 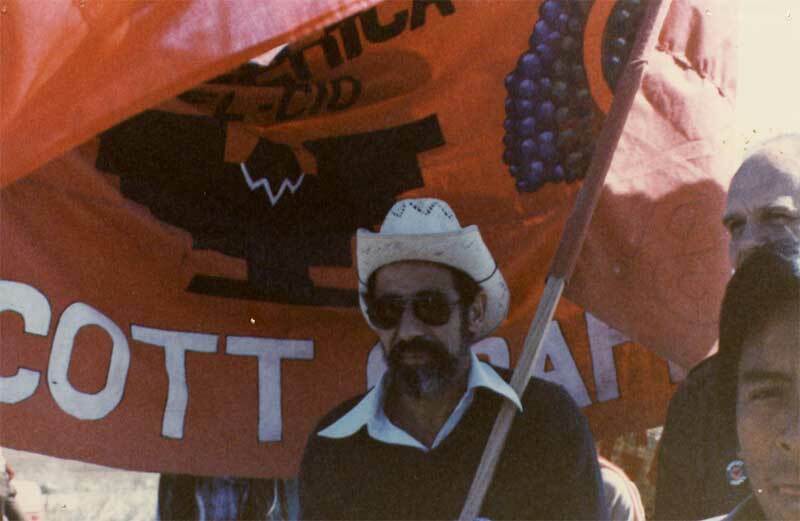 A group of UFW members approached Tomas Villanueva in the mid 1980s, requesting he assist them in the formation of the Washington branch, noting Villanueva’s experience with farm worker activism as well as his impeccable reputation as an organizer. 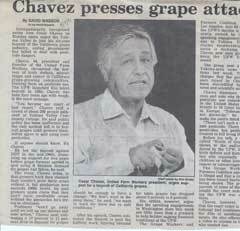 Soon after, he became involved in the renewed UFW campaigns to unionize. Despite expected threats and intimidation, the union was able to continue with its work. According to Villanueva, “in just the first two years we had over 25 strikes.” The first strike commenced at Pyramid Orchards on February 10, 1987. In the Pyramid Orchards strike there were only around sixty strikers. However, protestors on the picket lines during weekdays numbered at least 100 and on weekends 300 to 400. By five o’clock in the morning, people would stop by on their way to work, dropping off coffee and food for picketing workers. The WA State UFW activity renewed the long dormant farm worker movement. Meanwhile, anti-union forces were in the process of formulating a response to the organization’s actions. Villanueva told the workers who were asked by growers to work on such farms: “If your boss tells you to come, don’t come. They cannot fire you. They can fire you if you don’t work on their farm, but they cannot force you to work for somebody else.”6 In such critical times, the use of media outlets proved essential. For this purpose, Villanueva had started a radio talk show program on Radio KDNA, where he informed others of strike news and occurrences, answering call-in questions from people concerned about what was transpiring. Throughout the 1980s, the UFW continued its work fighting for a union and a voice. They picketed outside the Office of Employment and Security in Yakima, with farm workers eventually occupying the office in an attempt to call Washington State Governor Booth Gardner into a meeting. There were also numerous asparagus strikes throughout the decade. In spite of this tremendous loss to the UFW, the local Washington UFW continued its efforts in an ongoing struggle against the prominent Washington winery, Chateau Ste Michelle. During this campaign, the UFW would finally achieve what farm workers had sought for nearly a century: a binding contract with an agricultural employer. What distinguished the Chateau Saint Michelle campaign from other UFW campaigns was their confrontational approach and strong backing and support.10 Prior to the Chateau Saint Michelle campaign, the union had little backing and the National UFW had few resources to allocate for local struggles. In fact, affiliation with the national UFW office and the AFL-CIO did not occur until 1994. To supplement the lack of national labor support, more aggressive tactics were an organizational necessity. The strike started at the grassroots. A group of striking workers from Chateau Ste Michelle, including a volunteer named Kurt Peterson, sought out farm labor activist leader Rosalinda Guillen for support. Her experience with the Rainbow Coalition made the campaign more successful because of the tactics she used to pressured the winery. Guillen “created scenes” at share holder meetings for four successive years, rode the ferry system and pressure other workers to take the wines off of the ferries, and convinced other unions to join the UFW cause in worker solidarity. Unions that joined in the Chateau Ste Michelle cause included the flight attendant’s union, the international workers union, and the longshoreman workers union, the latter of which refused to unload Chateau Ste Michelle wines in Europe. International newspapers publicized this activity, bringing it to the attention of powerful unions and gaining international support for the strike. To hamper the committee’s actions, the winery brought in three union busters, to little effect. In addition to union busters, Valdemer Valasquez of the Farm Labor Organizing Committee (FLOC) attempted to raid the UFW’s campaign under Guillen’s leadership. According to Guillen, “He came in and tried to negotiate with the company for the contract under the auspices of FLOC. [This was] early 1994, before we had affiliated with the United Farm Workers of America. Then we out-organized him, basically, and sent him back to Ohio.” Though controversial, this was not the only time perceived farm worker advocates tried to overtake the UFW’s Chateau Saint Michelle campaign committee. 1 For more on Radio KDNA, go to //www.kdna.org/. 2 Tomas Villanueva Interview, 11 April 2003 and 7 June 2004 by Anne O’Neill and Sharon Walker. 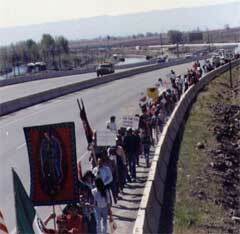 In April of 1986, over two thousand people participated in a march for farm worker rights in Yakima Valley. Cesar Chavez, President of the national United Farm Workers of America, led the marchers from Yakima along Interstate 82 south-bound to Granger in the Lower Yakima Valley. It was during this visit that Chavez approached Villanueva, requesting his assistance and leadership in the formation of the Washington branch of the UFW. 8 On August 8, 1994, President Clinton presented the ‘Medal of Freedom’ posthumously to Cesar Chavez in a ceremony attended by his wife, Helen, who accepted the honor in his memory. 9 Villanueva Interview, 11 April 2003 and 7 June 2004 by Anne O’Neill and Sharon Walker. 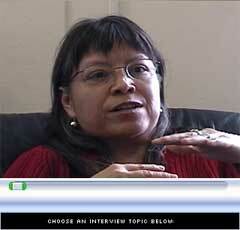 11 Rosalinda Guillen Interview, 12 April 2004, by Sharon Walker and Sarah Laslett. 12 In Guillen’s words, “First of all, I wasn’t from the area. I was from the coast, I’m a woman, and I hadn’t been involved. I wasn’t part of the old guard. I had a very close tie with the workers, and it’s amazing how so few people believed the transparency of the process we developed for strategic operations. Everything that we did, the workers were involved. I don’t think to this day that people believe that. That’s the disheartening part of the whole thing. Farm workers can do that. Cesar did it. We did it at Chateau Saint Michelle. A farm worker that can’t read and write, can lead a campaign. The fact that I can [read and write] doesn’t disqualify me from it. I came under attack many times for not being enough of a farm worker—I don’t have an accent, I can read and write, I’m not—I don’t know how to say it—mousey and quiet. We took leadership and moved the campaign forward the way the workers felt it needed to move forward. It had never happened before. It was a difficult time. Our cars were vandalized. We spent two weeks without vehicles because someone had vandalized all of our vehicles. Sugar in the engines, my gas tank, somebody had poked holes in it. A lot of things happened in our campaign and we just continued pushing forward,” Rosalinda Guillen Interview, 12 April 2004.